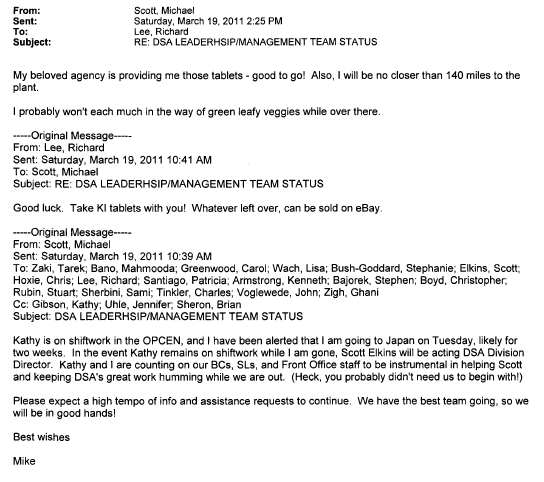 March 19th, 2011 – The NRC gave Michael Scott KI to go to Japan – He probably won’t each much in the way of green leafy veggies while over there. My beloved agency is providing me those tablets – good to go! Also, I will be no closer than 140 miles to the plant. I probably won’t each much in the way of green leafy veggies while over there. Good luck. Take KI tablets with you! Whatever left over, can be sold on eBay. Please expect a high tempo of info and assistance requests to continue. We have the best team going, so we will be in good hands! March 19th, 2011 – Risk of further explosions in SPFs – Should SFP be removed to temporary storage?